Sagami was an administrative district in classic Japan. The area of Sagami was very small, it was on the part of southern Kangawa Prefecture. Sagami belonged to Tokai-do region, and it was counted as a upper and farther country. The location of the provincial government of Sagami is not known, some said it was on Odawara, and others said it was in Ebina, Hiratsuka and Oiso. Kokubun-ji Temple were built in Ebina City. And Samukawa-jinja Shrine was registered as Ichinomiya (the first shrine) of Sagami-no-kuni. This district was designated on the Ritsuryo code after the Taika Reform in 645. Late Heian Period, some local samurai families Dohi, Ooba, Kajiwara, Miura, Wada and so on who were the relatives of the Taira Clan settled in Sagami-no-kuni and tried to develop the region. They served Yoritomo Minamoto the founder of Kamakura Bakufu and the first Shogun of the Bakufu, and they helped him to raise his arm against the Taira Clan in Kyoto, and they became Yoritomo's Gokenin (shogunal retainers of the Kamakura bakufu). In 1192, Yoritomo was appointed as the Shogun and founded the Kamakura Bakufu (the Kamakura Shogunate) in Kamakura on the eastern part of Sagami Province. Therefore during Kamakura Period, Sagami Province was directly ruled and administrated by the Shogun Familiy. And the governor of Sagami was owned by the Miura Clan, but after the Miura had ruined, the post of the governor was not appointed. Yoritomo fixed the administrative organization and planned development of Kamakura. In 1230, Kamakura was at its zenith and the center of the samurai society in Japan, and the population of Kamakura was over 30 million, so it almost the capital city of Japan in real. Moreover, Kamakura Bakufu was the first sumurai government to control throughout Japan. Yoritomo Minamoto and his son and his grandchildren, the Minamoto Clan was ruined in three generations, then the Hojo Clan, the family of Masako Hojo, the wife of Yoritomo, seized power to rule the Bakufu. The Hojo Regency started, the office of regent administrated the Bakufu and ruled Japan instead of the Shogun, so the position of the Shogun sounded like a doll. While the development of Kamakura's economy, many products, culture, thoughts, and technologies were carried there from China, and of course Zen Sect of Buddhism came in Kamakura, then the Great Buddha at Hase, Kencho-ji Temple, Enkaku-ji Temple and other temples belonging to Zen Sect were built in. Sagami Province flourished as the capital of Japan. The Kamakura Bakufu ended in 1333. When Muromachi Period started in 1333, the Muramachi Bakufu established Kamakura-fu (a regional office of the Muromachi Bakufu) to rule the eight provinces in Kanto Region. The director of the office was Kamakura Kubo (the Kamakura shogun), but Kanto Kanrei (the chief counselors of the Kamakura shogun) seized the power to control the region in real. This relation between them caused some conflicts in the Kanto Region. The Battle of Kyotoku happened in 1454, so the Kamakura Kubo Shigeuji Ashikaga assassinated Kanto Kanrei Noritada Uesugi. It was the beginning of the Sengoku Period in Kanto Region. In 1455, Kamakura Shogun Nariuji Ashikaga tried to fight against the Muromach Shogun, but Nariuji lost and escaped to Koga in Shimousa. After left Kamakura, the city lost its flourishness, it became the agricultural and fishermans community. In 1495, Soun Hojo (the founder of Go-Hojo Clan) seized the Odawara Castle in western Kanagawa Prefecture. After Soun moved to Odawara, he developed his influence through Sagami Province actively and aggressively, and his clan had ruled it almost 100 years. Some Daimyos tried to invade the province several times, Kenshin Ueshugi from Echigo-no-kuni, the great hero of the Sengoku Period, surrounded the Odawara Castle for a month to gain the power in Kanto Region in 1561, some told the Kenshin took over 110,000 samurai worriers to the battle, but he could not win, he quit to fight against the Hojo Clan and went back to Echigo. And In 1569, Shigen Takeda invaded into Sagami Province and attacked the Odawara Castle, but he lost the operation. The Odawara Castle was called the impregnable castle. In 1590, Hideyoshi Toyotomi who was the was the Kanpaku Dajo-daijin (the supreme minister and chancellor) won the Siege of Odawara, the Hojo Clan ruined, and Ieyasu Tokugawa moved to Kanto, and he ruled the region at Edo Castle. During Edo Period, almost all parts in Sagami Province were ruled by Edo Bakufu (the Edo Shogunate) without Odawara, because Tokai-do road passed through the Province. Odawara was the gate city on the road. Therefore the Daimyo (samurai lords) owning the Odawara-jo Castle were given some important roles to protect Edo. 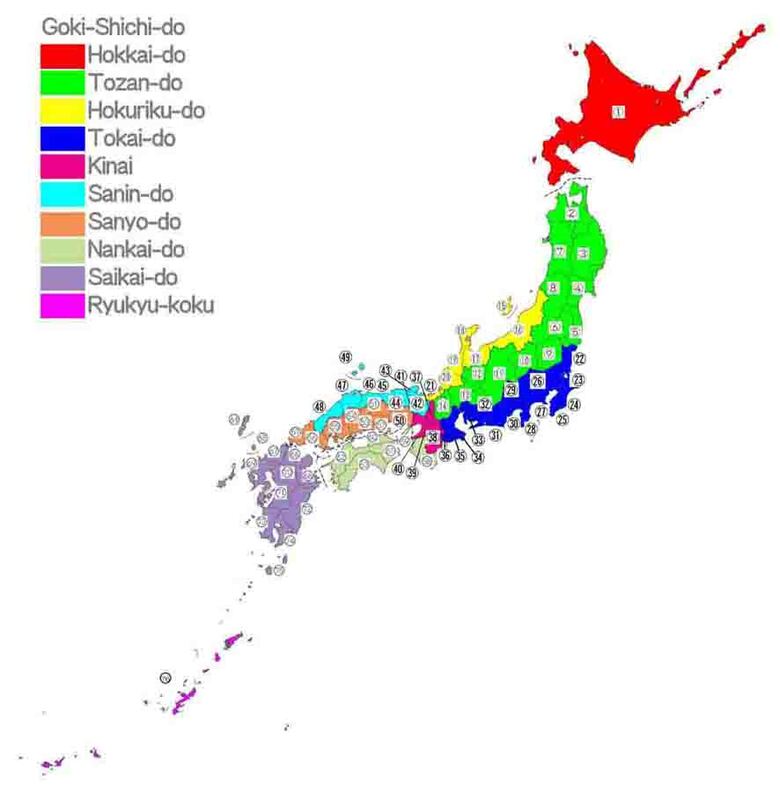 Odawara was the western barrier of Edo, so the Edo Bakufu chose reliable daimyos in hereditary vassalage to the Tokugawa such as Okubo, Abe and Inaba. Moreover Odawara was of course the castle town of the Odawara-jo Castle, and also it was most flourished post town in Tokai-do fifty-three post towns. Moreover, the temples and shrines restored in Kamakura, and visitors of them gradually increased. In the seventeenth century, Mitsukuni Tokugawa edited Shinpen Kamakurashi (the new editions of Kamakura's history), visitors from Edo had read it and came Kamakura to see Enoshima Island and some historical heritages in the temples and shirines in Kamakura. As Kamakura, Odawara and so on were on Tokai-do road, Sagami Province has developed as the post town and the tourist city since Edo Period. Uraga where the United States Fleet commanded by Matthew Perry came to Japan in 1853 and he ordered to open Japan to the west was in Sagami Province. After Meiji Restoration, the classical districts were rebuilt, Sagami Province merged with southern part of Musashi Province to be Kanagawa Prefecture in 1871.